Wants and needs? We all want to save money on our kitchen renovation, but we need to ensure that we keep with quality, good design and function. 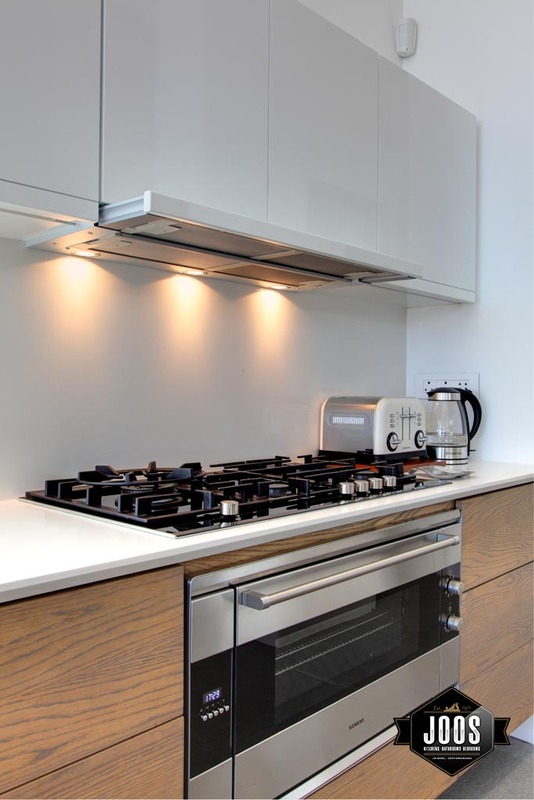 Over our 40 plus years in the industry we have picked up on some tips and suggestions for ways we can work with you to maximise your budget and still achieve that dream Joos Kitchen to make your own. Some elements of your kitchen renovation are simply going to be costlier than others. 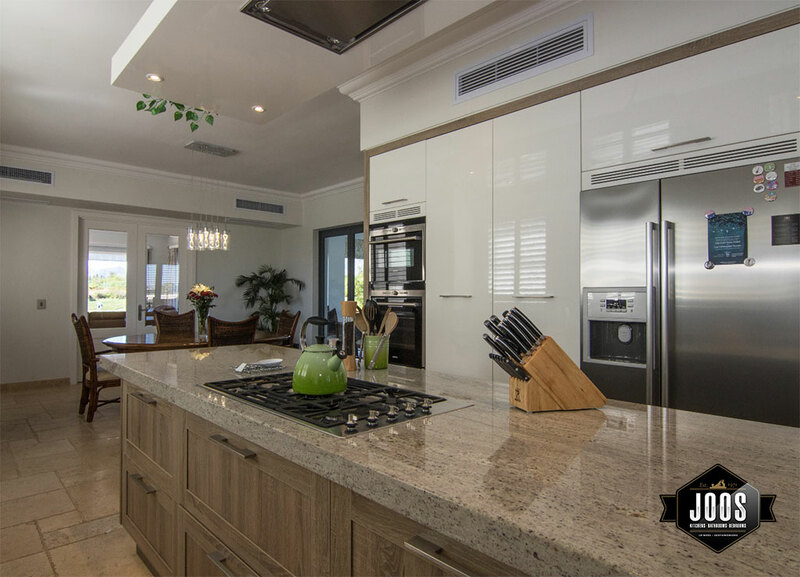 These include things like stone counters, choices of materials, layout and internal mechanisms that make your kitchen work. If you can keep the design simple than you can keep the cost down too. Some examples of where you can save are using an engineered stone over Mother Nature’s offering. Today’s engineered stones so closely mimic the genuine article and come with a host of additional benefits. 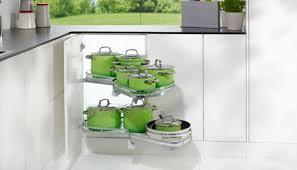 Everyone needs drawers in a kitchen but how many will affect cost. Good quality drawer runner mechanisms as a non-negotiable – so are good hinges. Doors cost less than drawers in terms of runners so work with your design to find a balance. Also consider using one bank of 900mm wide drawers as opposed to two banks of 450mm wide drawers….you will need half the runners and save half the amount some money too! Another tip is to keep your cabinet sizes the same wherever possible. Your eye is drawn to symmetry and your kitchen will have a designer appeal if you can maintain cabinets at the same width. 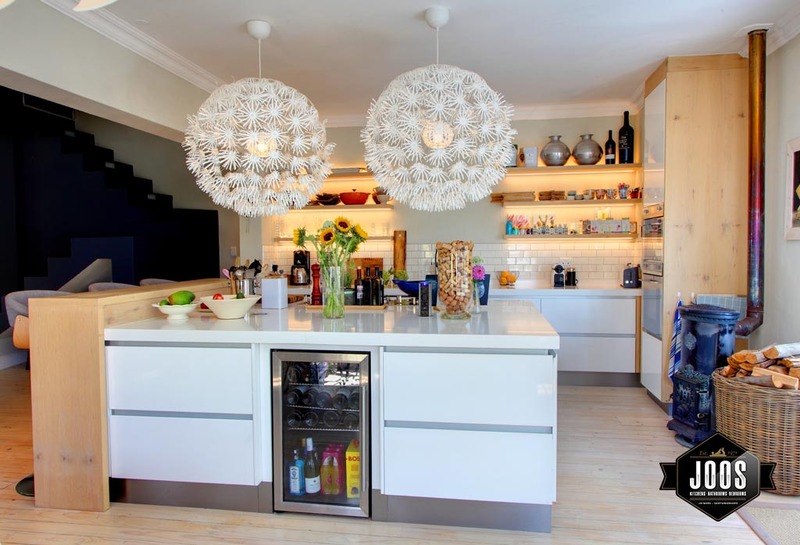 See the below images of simple yet symmetrical cabinetry. Also shown is a detail of wide drawers that are fairly cost-effective. 2. Are Upper Cupboards Necessary? 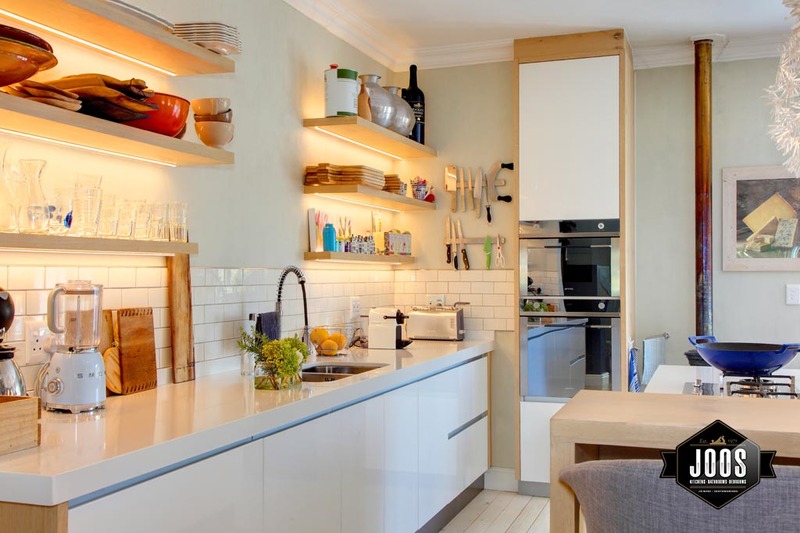 Do you need wall cupboards above every counter? Could you incorporate some shelves? This can help in opening out your kitchen and making it appear more spacious – while helping you save on your budget. On an average kitchen, this could mean savings of around 15 – 25% of the total cost. You will need to weigh up your storage needs. Sometimes there will be no other option but to incorporate wall cabinets into your design. Below, are some stylish looking kitchens that are wall cabinet free.or that have managed to keep wall cabinets to a minimum. 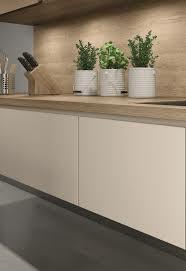 The finish you choose for you kitchen can have a dramatic effect on budget. Fortunately there are many options available that can give a very similar look. The choice is endless as both local and international suppliers push the boundaries of design and technology with a huge variety finishes available. Flat panel doors are often selected for modern kitchens and most homeowners opt to finish these with a satin Duco or High Gloss paint finish. The same look can be achieved with a laminate finish – in matt, high gloss or textured. 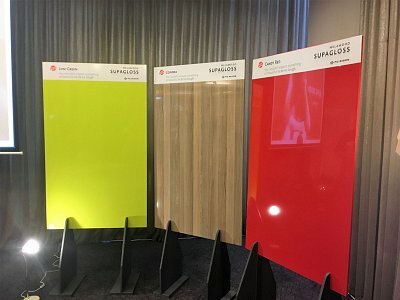 Joos joiners work with PG Bison, Niemann Boards and Egger who present a stunning range of choice – see images below and start dreaming. 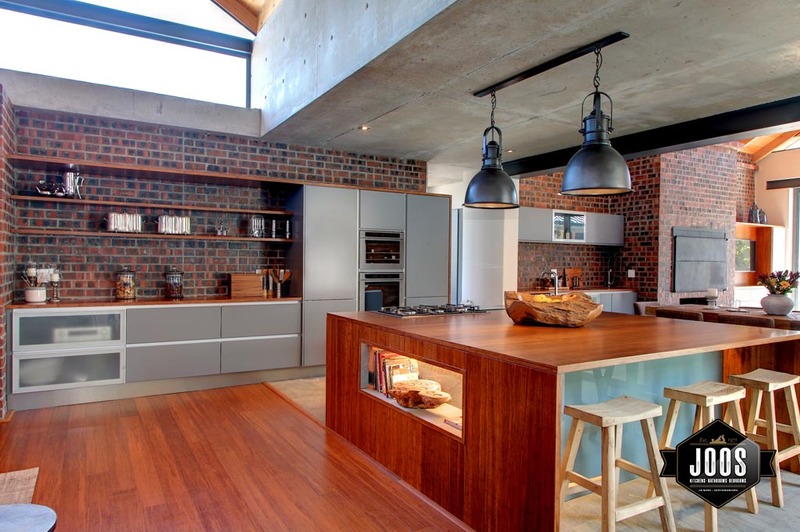 Solid timber, at one point, was highly sought after for kitchen finishes. As our natural resources have come under pressure we have seen prices for this resource climb. The consumer is now switching on conscience as well as budget. Again suppliers have responded with vast array of options to choose from and at a variety of price points. Space saving and organisation mechanisms are a great to have, however, like with all things, prioritise what you are non-negotiable on and stick to those items only. Choose what is going to be used most often and to best effect. For example a good quality plastic pull out bin performs the same function as a snazzy integrated European model- after all they are both concealed. A saving here may allow budget to extend to a Lazy Suzan or Lemans unit for that corner Tupperware cupboard you know you are going to use every day. Keeping your budget in line does not have to compromise the look and quality of your kitchen. Your appliance selection is going to affect your budget dramatically. Our main recommendation here is to never go for the cheapest made appliances – as attractive as the low prices may seem. We suggest sticking to a reputable brand, even some of the top brands such as Smeg and Miele and opting for their lowest range product. That way you will be assured of quality but are not overpaying for features that you may not even use. 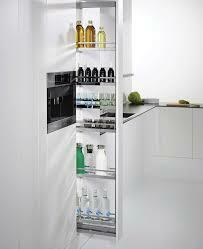 Remember that Joos Joiners are authorised resellers of Smeg, Miele, Bosch, Faber, Siemens and Gaggenau. As any Estate Agent will tell you – Kitchens sell houses. 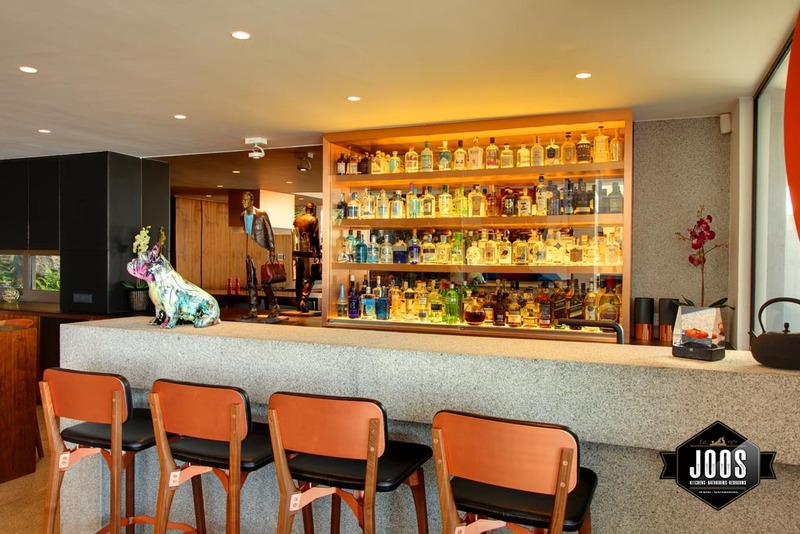 Below are our top tips on where you should never scrimp on your renovation and where you should invest your money to achieve the best outcome. There is nothing worse than seeing a newly renovated kitchen where the cabinets do not fit. . The cabinets do not reach the ceiling, and there are filler panels where cabinets should have been extended. 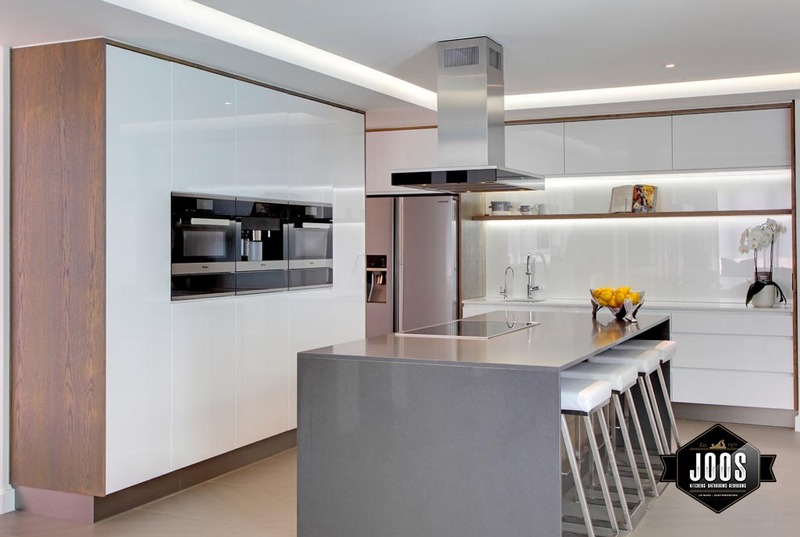 Joos Joiners understands that every building is unique so it is not very often that a prefabricated kitchen will work with the measurements that your space allows. Your renovation will look half complete. Rather spend the extra so that the kitchen becomes part of the architecture rather than looking like mismatched cabinets stuck into place. 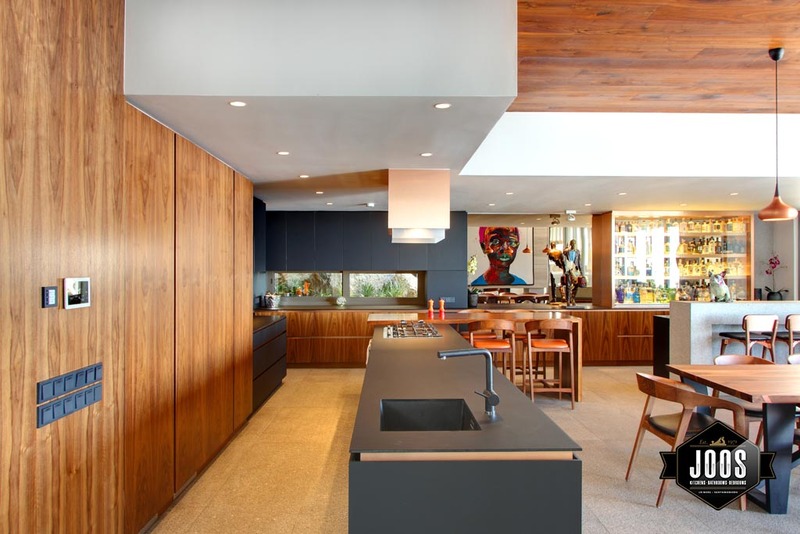 Look at the picture below to see how a Joos Kitchen perfectly fits the space ….and matches the surrounding décor. Remembering that your kitchen is essentially a workspace means not forgetting to spend money on excellent quality hinges and runners. You want your drawers and doors to open and close without effort. You want hassle-free longevity in your hinges and runners. Joos Joiners uses German made hinges and runners that are highly engineered and precision made. Our hinges and runners have a lifetime warranty and the cost is not going to break the bank, but it will keep your kitchen functioning smoothly over many years of use. Do not compromise on the hinges and runners (make sure you choose the soft closing options too) you definitely won’t regret it! A beautiful counter needs to be both practical and beautiful. Laminate tops, while they have their place, cannot complete with the pizazz that a natural or engineered stone give to a kitchen. Immensely practical and durable a stone counter will also add value should you be in the rental or resale market. 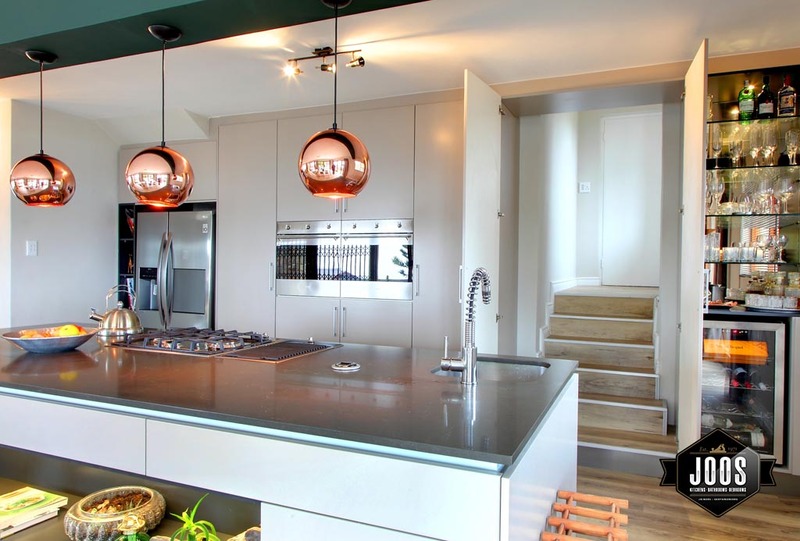 Lighting design is something many kitchen designers fail to address. The kitchen is a work space, and needs ample task lighting, but it also needs ambience lighting too. LED task lighting under wall cabinetry and pendant lighting coupled together with some overhead lighting should do the trick. There are many ways you can save money on your kitchen renovation. Much of this comes down to a cleverly designed space using good quality but reasonably priced materials. To keep the cost down, strip the kitchen back to its bare necessity but pay close attention to the details.